As barbeque season approaches I am always searching for new dishes to bring to summer parties. Recently, I was put to the test when a friend asked if I could bring a mayo-less potato salad to her cookout. Potato salad without mayonnaise! I thought she was out of her mind! However, I accepted the challenge anyway. As I tried to conceptualize the dish, I remembered a recipe for German style potato salad that swapped the mayonnaise based dressing for a light and lemony vinaigrette with fresh herbs. I took the potato salad remix a bit further. 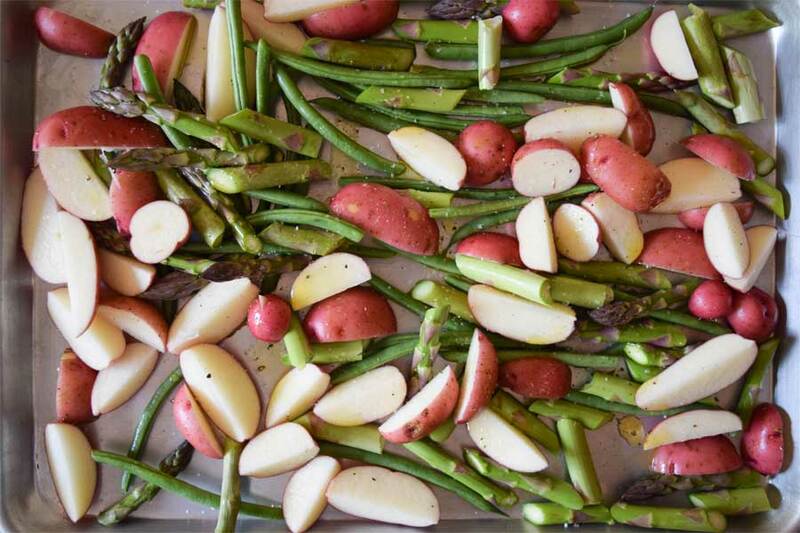 Instead of boiling the potatoes, I roasted them along with some asparagus and green beans for a more complex flavor. 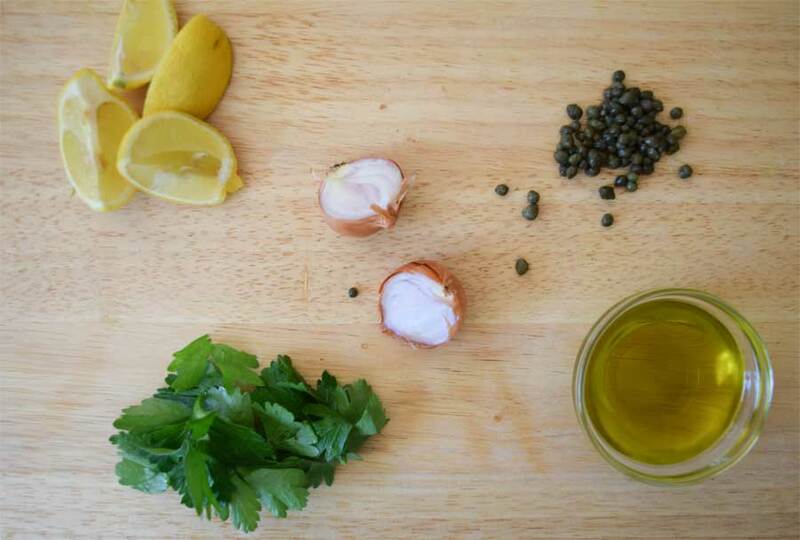 For the dressing I made a simple lemon vinaigrette and added some shallot for a little bite and caper for a salty tang. Although my final product may have strayed far from classic potato salad, the cookout guests devoured it. It is perfect for a picnic or barbeque because it can be eaten at room temperature. Need to bring it somewhere? No problem! Roast the vegetables and make the dressing but wait to toss them together until you’ve arrived at the party. This will help the vegetables stay crisp and keep the herb flavor bright and fresh. Wash all your vegetables and dry them really well. The drier they are the more they will crisp up in the oven. 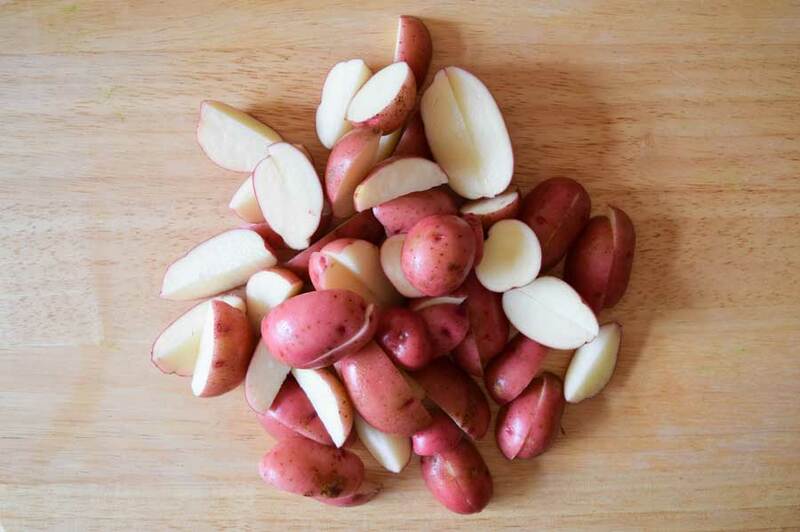 Cut the red potatoes in half or in quarters depending on how large they are, and place on a sheet tray. To prepare the asparagus, remove the woody ends. 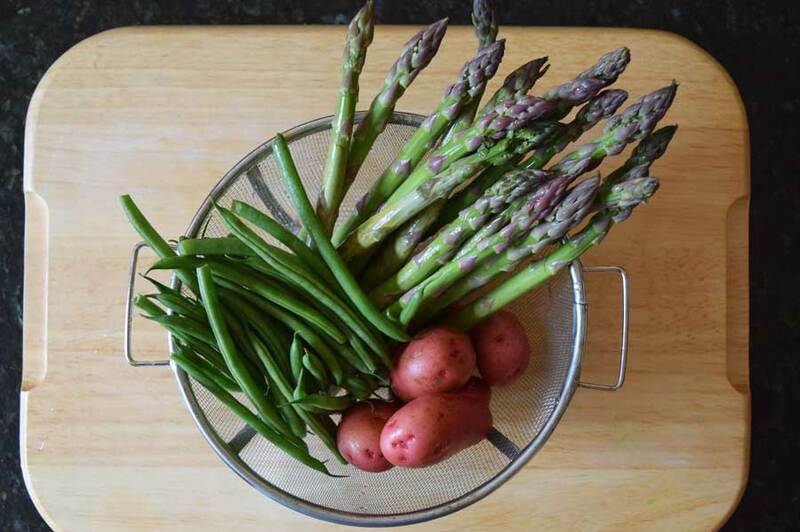 You can cut them off or use your hands and bend the asparagus near the bottom. The woody part will snap off. 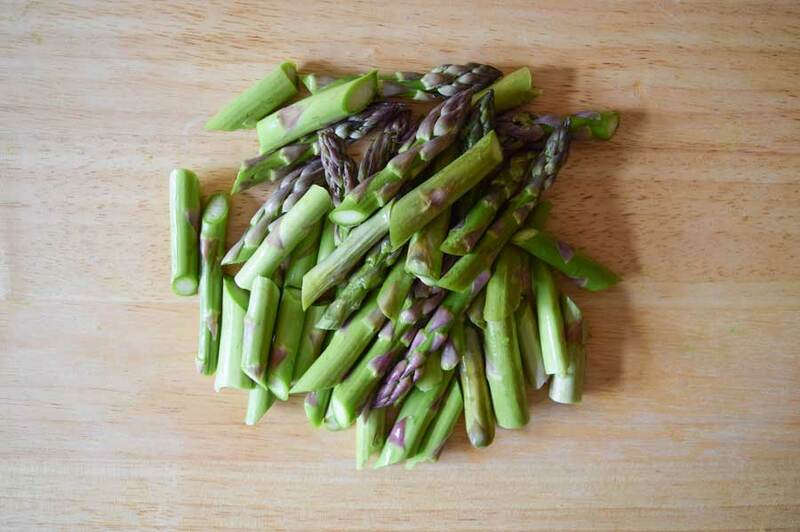 Discard the ends and cut the stalks of asparagus into halves or thirds depending on how long they are. Add the asparagus to the sheet tray. Remove the tips of the green bean and add to the sheet tray. Splash about a tablespoon of oil over the vegetables and season liberally with salt and pepper. Toss the vegetables together, making sure they are coated evenly with oil, salt, and pepper. Place in the oven and roast for 20-30 minutes, tossing intermittently. The vegetables are done once you can pierce a potato with a fork easily. The potatoes should also have a nice brown crust on them. If you like your vegetables with a little more color on them (like I do) you can continue to roast until the desired color. While the vegetables are roasting make the vinaigrette. I do it by throwing all the ingredients into a jar, sealing it shut, and shaking it vigorously. 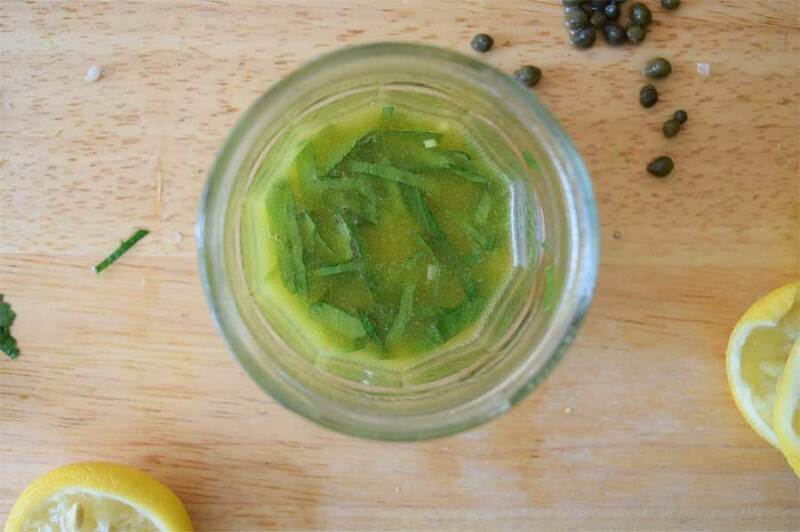 Once the vinaigrette has a smooth consistency and the oil and the lemon juice are fully incorporated into one another you can taste it and see if the seasoning needs adjusting. Add more salt or pepper if necessary and then shake again. Pull the vegetables from the oven and let cool slightly. When you are ready to serve, transfer the vegetables to a large bowl and top with a little bit of the dressing. You may not need all of it, just enough to moisten the salad, but add as much as you like. Finally, garnish with a little chopped parsley and serve immediately. 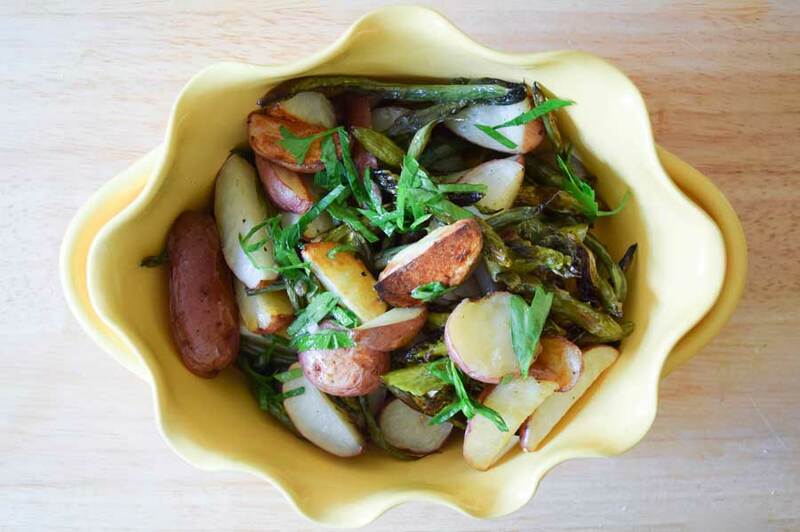 Cook’s note: If you like your asparagus and green beans a little firmer, you can achieve this by giving the potatoes a head start. 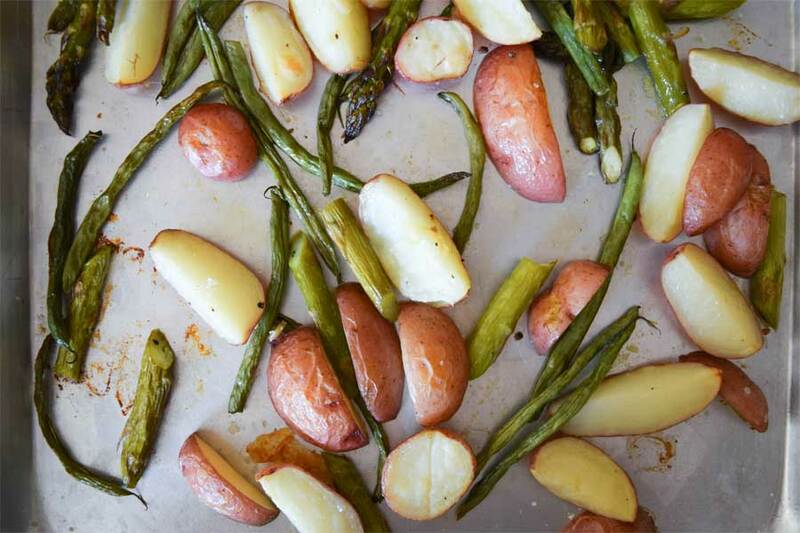 Roast the potatoes for 10 minutes before you add the other vegetables and then roast everything for another 10 to 15 minutes. I like the simplicity of doing it all at once though!